the official blog for Les Belles Bouclettes! We’d like to take this our first post, as an opportunity to introduce our blog and tell you a little about Les Belles Bouclettes, because it is the beginning of the story. Ferme Bonne Mine is the farm on which many of our creations are crafted , and it is located in beautiful eastern Ontario Canada. In addition to Isabelle and her family, a happy herd of angora goats and their llama guardians live on it, and they are the foundations of Les Belles Bouclettes, where this blog was first conceived. But then everything about Les Belles Bouclettes begins with these fun loving, happy angora goats and their gorgeous mohair fleeces. From their fleeces come the locks (from which Les Belles Bouclettes got its name, beautiful locks), rovings and yarn. While selling the fibre was the original plan it quickly began to expand. 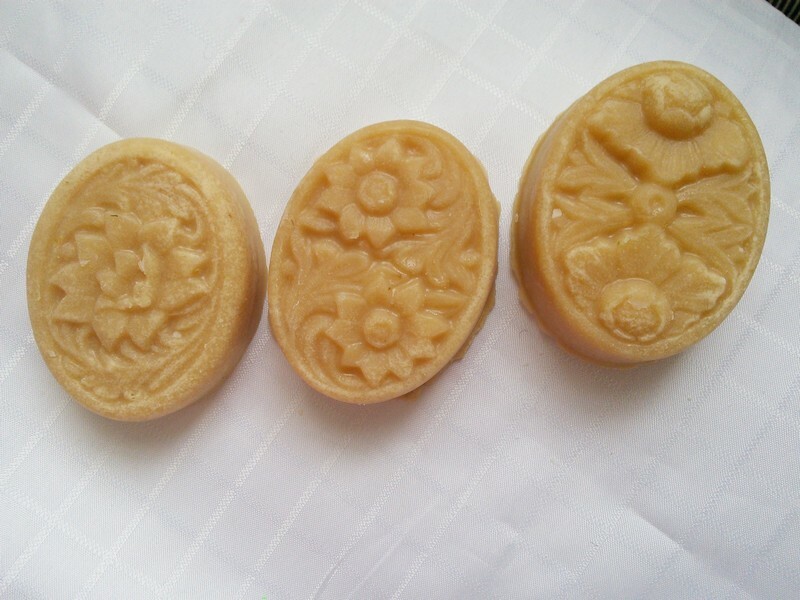 First the idea of doing something extra, a way in which to use our fabulous goat’s milk was discussed, and soon there was a line of goat’s milk soap made especially for Les Belles Bouclettes. (And when the soap became part of Les Belles Bouclettes’ story so did I, Grey Dove.) And then, there were all these fabulous fibres, just sitting there while they waited for their new homes, and we couldn’t resist playing with them. (Beg pardon, that is of course crafting and creating with them!) 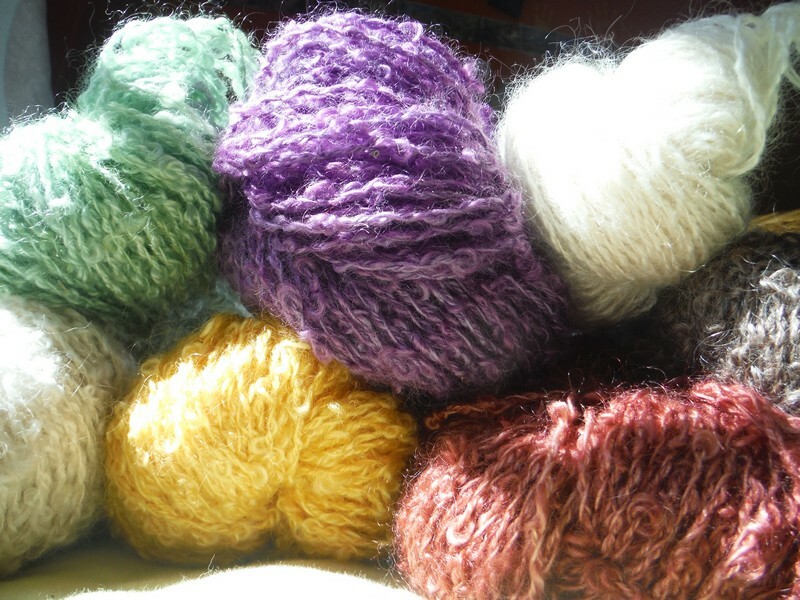 From felting our goat’s milk soap, to “painting” with rovings, and knitting the yarn into soap sacks and baby garments the mohair is a constant source of pleasure and creative inspiration. Many of our other product lines are spin-offs from the mohair based products, or compliment existing product lines. We enjoy the processes involved in all aspects of our creations, from shearing the goats and sorting the fleeces, to wrapping the soap made with their milk and felting it in their mohair rovings; and we want to share all of it, with you! From the rhythms and seasonal aspects of farm life and the way they impact our products, to daily life working with the animals and the fibre. From our goats latest adventures, to the newest creation we are trying our hand at, and all the topics in between. Most of all we look forward to having this time and space to interact with you, the people who share our love for and interest in these natural materials and the variety of wonderful things we can craft using them. So Welcome to the farm, we are glad you stopped in! Traditionally crafting was done in groups and had social aspects as well as practical and creative ones. So please join us whenever you can in our cyber farm kitchen, and feel free to comment, share your thoughts and ask us questions. We want this to be a conversation and we will be happy to discuss topics via the comments sections or even plan posts around topics that you raise or ask about. To get things started our first few posts will be in-depths discussions of some of the ingredients we use in our bath and body care products, and some of the products we have made using our fibre. We have video clips of the spring shearing to share with you, and wanted to post photos and tell you more about the sorting involved in choosing and preparing (skirting) the best fleeces for carding and spinning. Thanks for stopping by, we look forward to seeing you again soon, and often! What a wonderful blog! I enjoyed reading all about your wonderful farm. And may I say that your products are absolutely fabulous. My skin has improved since I started using your goat’s milk soap. My friends say that I’m “glowing”. I’m so delighted with this product! We are planning projects for the autumn and of course we will be buying our wool from Les Belles Bouclettes. I’m going to share your site with all my friends. And thank you for the compliments and positive reviews! We love to hear that our customers are enjoying our products. Please let us know if you have any questions or need any suggestions. We look forward to you visiting on FromGoats To Soaps again and hope you’ll stop in and chat often. This is marvellous, well written and so interesting.. Delighted you enjoyed visiting our blog! Thank you so much for taking the time to stop by. We hope you will be a frequent visitor. We look forward to chatting with you and sharing the interesting posts we have planned! I always look forward to your news letter and I’m absolutely delighted with the gift ideas and projects I find on your site. Rest assured that I will be a frequent visitor. So pleased to hear you are enjoying our online boutique and our blog. Hearing from long time customers is always a special treat! Also, thank you for the compliments on the television segment. It was filmed many years ago before Les Belles Bouclettes came to be (that is there weren’t any angora goats here at the time), but that was definitely Isabelle’s farm featured on the programme. We’ve expanded and changed so much since then! We’re delighted you like our products and hope you will keep visiting all our sites. And our comments sections, your thoughts and suggestions are Always welcome.